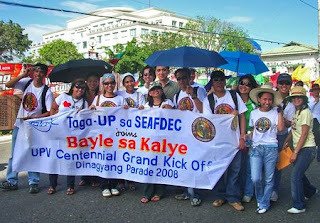 Calling themselves Taga-UP sa SEAFDEC, AQD-based alumni and graduate students of the University of the Philippines were among the estimated 6,000 people who attended the UP Visayas Grand Centennial Parade last January 26. The AQD contingent marched the 4-kilometer parade nicknamed Bayle sa Kalye which began at Plaza Libertad and culminated with a program at the UP Iloilo City Campus. The parade jumpstarts the year-round centennial celebration of UP to be highlighted by a Grand Centennial Alumni Homecoming in Araneta Coliseum this June and a Grand Lantern Parade at UP Diliman in December. A notable number of AQD employees are UP alumni including the Chief and three Division Heads.